2017 filament lamp for LED export-oriented enterprises in Ch — Yangzhou Dinghong Lighting Equipment Co., Ltd. 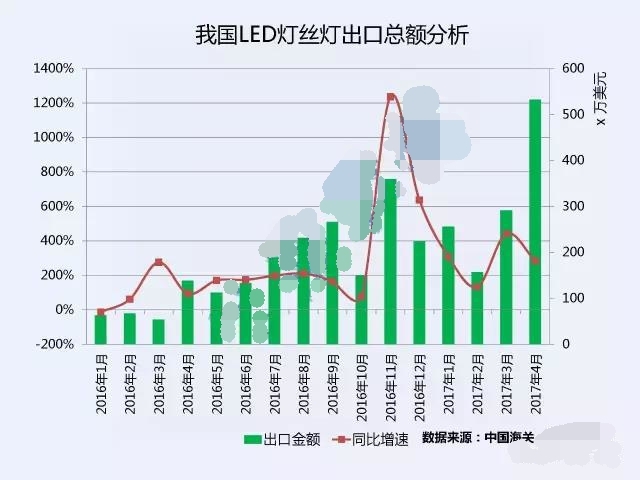 According to network news in four months before 2017, China LED the filament lamps meet the 12.37 million dollars in exports, an increase of 284%, is the fastest of all product types. First quarter imports US $4.79 million ranked market 38.74%, followed by the Netherlands, Germany, Poland and Italy, the filament lamps the top five importing countries accounted for close to 76%. Filament lamps of China’s top ten companies exports amounted to us $3.17 million, filament lamp export markets accounted for 90.45%, visible, filament lamps the concentration is very high. 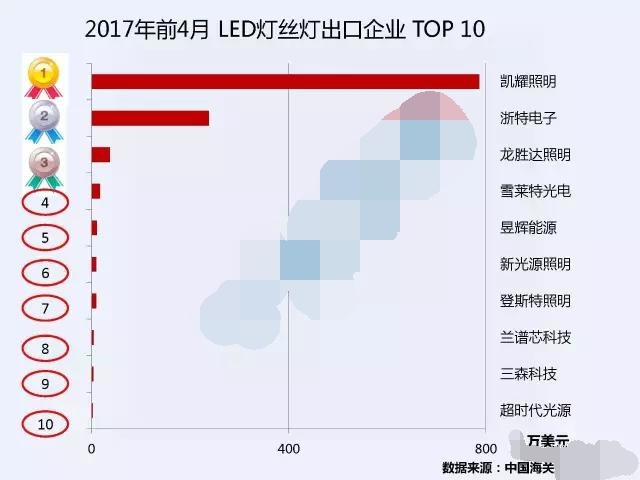 Here are four months before 2017 filament lamp exports LED the top ten enterprises in China. Kai Yiu electrical appliances manufacture limited company is a the leader of LED lighting products and professional solution provider, located in Ningbo beilun Jian “Kai Yiu Technology Park”, and in Shanghai, Jiangxi Jiujiang, Haining, Zhejiang, Dongguan has a factory and Research Center. Our main products are: LED lighting, LED drivers, energy-saving lamps, electronic ballast, electronic transformer, bracket lamps, grille and other products. 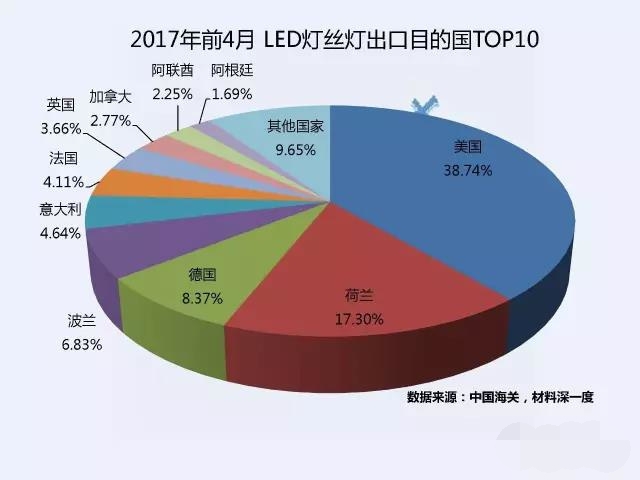 Two months before 2017, LED exports Kai Yiu Electrical filament lamp to $7.87 million on top, LED 63.59% filament lamp export markets in 2016, representing a growth of 535.62% over, growing quite rapidly. LED four months before 2017 filament lamps are mainly exported to the United States, Poland and Germany. 2017 1: ranked April first. Hangzhou Zhejiang electronics limited in 2009 registered business scope: LED fluorescent tubes, lamps, lamps and accessories production. Services: lighting technology development, and technical services. Sell: light emitting diodes, optical components, electronic components, lamps, lighting appliances import and export goods. Four months before 2017 LED filament lamps are mainly exported to the Netherlands, Germany and Belgium. 2017 1 April: ranked second. Xiamen Longsheng lighting electric Ltd is a foreign-owned company, founded in 1997, is headquartered in Xiamen, Fujian, the main production of electronic energy-saving lamps, electronic ballasts, such as environmental protection and energy saving products. LED four months before 2017 filament lamps are mainly exported to the United States and Canada. 2017 1 April: ranked third. Guangdong snow Wright optoelectronic Technology Corporation, founded in 1992, is one of the lighting field representative in China-listed companies. Main products: LED lighting, energy-saving lamps, HID Xenon lights, air purification, water treatment, ultraviolet germicidal lamp, and so on. Four months before 2017 LED filament lamps are mainly exported to the United States and Iran. 2017 1 April: ranked fourth. Shanghai Yuhui Energy Science and technology limited company is founded in 2013, the main business areas are: Energy Science and technology, solar power, photovoltaic power generation technology in the field of technology development, technical advice, technology transfer, technical services wholesale energy equipment, lighting equipment, batteries. LED four months before 2017 filament lamps are mainly exported to Italy, Thailand and South Africa. 2017 1 April: ranked fifth. Haining new lighting technology Corporation is a large OEM factory has over 20 years experience in lighting, but also one of the earliest production of LED lighting products manufacturer, green, energy-saving, environmentally-friendly product development and production, main filament LED lamp, LED lamp, LED panel light, LED bulbs, etc. Four months before 2017 LED filament lamps are mainly exported to Israel, the Dominican Republic and Spain. 2017 1 April: ranked sixth. The company was set up in 2014, the main new filament LED light bulbs and LED light bulbs. Four months before 2017 LED filament lamps are mainly exported to Germany. 2017 1 April: ranked seventh. Shenzhen lump core science and technology limited company is founded in 2012, is Shenzhen’s first professional development with high-end materials filament and the filament lamps for power supply manufacturing LED manufacturers. With 6 fully-automated production equipment, the maximum monthly capacity of 1 million. LED four months before 2017 filament lamps are mainly exported to the United States, Indonesia and the Netherlands. 2017 1 February: ranked eighth. Zhejiang Mimori Technology AG (formerly shangyu Fu lighting limited) was established in 2009, specializing in the production of LED lamps, energy saving lamps, brackets, work light. Four months before 2017 LED filament lamps are mainly exported to South Korea. 2017 1 April: ranked Nineth. 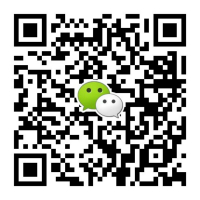 Founded in 1998, mainly engaged in the development and production of light bulbs, lamp lighting and other electrical appliances. LED four months before 2017 filament lamps are mainly exported to Brazil and the United Kingdom. 2017 1: ranked April tenth.